A quick look into the demographics of the Near Eastside of Indianapolis community will reveal that it is comprised of 20 different neighborhoods encompassing over 40,000 residents. Of the 40,000, 24% do not have a high school diploma and according to the U.S. census the unemployment rate was almost 10% in 2000 and has risen steadily since. In addition to this, many of the students that attend IPS #15 are classified as “at-risk” with 97% of students qualifying for free or reduced lunch. As a result of these socio-economic hardships, many of these students may feel that they can’t do anything to make a difference in their community. Arts for Learning Indiana set out to change this by empowering students and giving them an opportunity to make a tangible difference in their community and a fresh start. Fresh stART Indy is a program created by Arts for Learning Indiana which seeks to strengthen and regenerate the Near Eastside Indianapolis community through the arts. The Fresh StART Indy Project was inspired by Keep Cincinnati Beautiful’s Future Blooms program, now called the Arts program. Arts for Learning sought to give the students of the Near Eastside and experience with professional artists that would allow them to understand art and the world around them. They also wanted the students to be able to create the art form themselves and connect the art form to other areas of academic learning and life skill development. Arts for Learning had a number of potential partners for Fresh StART Indy, and ultimately ended up partnering with IPS #15. 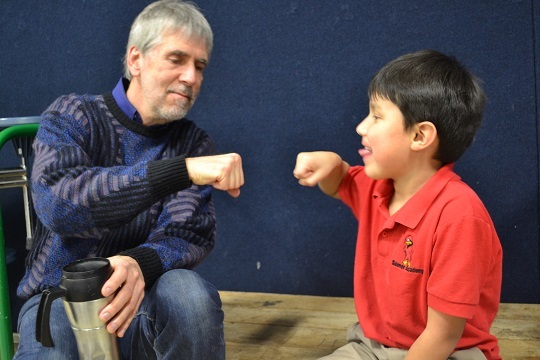 In December of 2014, students at IPS #15 began to experience workshops with professional teaching artists. Four Artists were involved in the Fresh StART program – poet Tony Styxx, storyteller Bob Sander, songwriter Bobbie Lancaster, and visual artist Meredith Brickell - and over 150 1st, 3rd, 4th, 5th and 6th grade IPS #15 students. Throughout the course of the semester, the students from IPS #15 participated in 18 workshops led by the artists in each of their respective disciplines. These workshops allowed the students to focus on identifying and highlighting aspects of their community that were important to them and gave them to opportunity to bring them to life through their own art in ways that were meaningful to them. 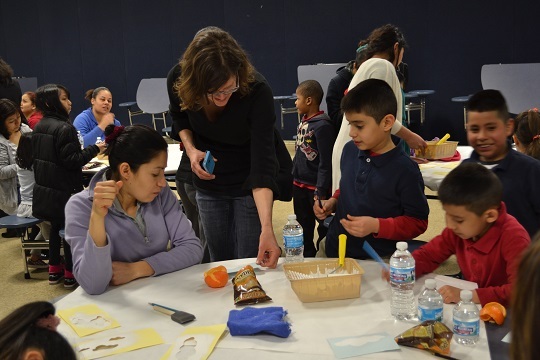 In addition to the student workshops, Arts for Learning Indiana also hosted two community-wide “Family Nights”. These family nights brought students and their families together to inspire creativity through arts activities and also gave them an open forum in which to discuss specific ways that they wanted to improve the local community. The interactions that Brickell had with the students and their families during the course of the workshops and family nights served as inspiration for the design of the final installation. One story in particular comes to Meredith Brickell’s mind when asked what specifically inspired the final installation. Brickell was leading one of the workshops with IPS #15’s 5th grade students and prompted them to think about “what is truly present in their neighborhood”. The response she got surprised her. Despite the sometimes oppressive presence of abandoned lots and vacant spaces, the students began naming off positive aspects of the neighborhood including flowers, trees, animals and clouds. One student’s declaration that “I want to be able to watch clouds!” served as the final spark of inspiration that allowed Brickell to come up with the idea for the “Cloud Observatory”. The cloud observatory is a wooden structure that Brickell designed to provide the optimal cloud viewing experience in a safe and comfortable environment.  It is easy to see that the impact that the program has had on the entire community goes beyond that of simply the addition a finite, physical structure. Ross Pippin, the Assistant Principal of IPS #15 was hugely enthusiastic about the impact that he has already seen in the community and his students in general. 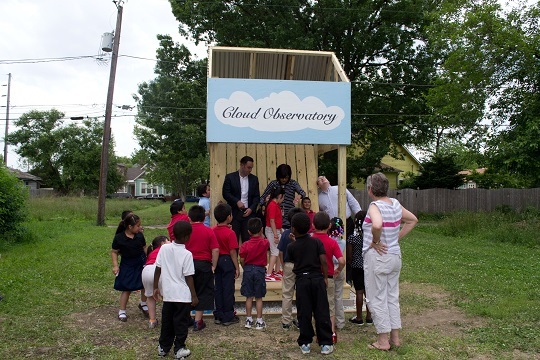 The cloud observatory now resides in the previously vacant lot at 518 Beville Avenue where students walking by on their way to school can stop and enjoy their very own cloud watching experiences. To learn more about Arts for Learning Indiana and the programs they provide, visit their website at www.artsforlearningindiana.org . To learn more about IPS #15, visit their website at http://www.myips.org/thomasdgregg15 .